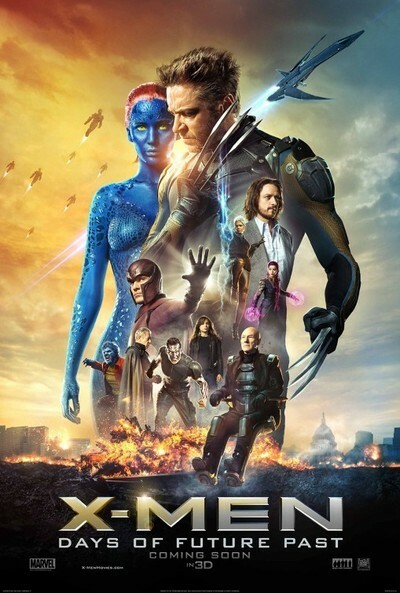 "X-Men: Days of Future Past" is a better than but not substantially different from other superhero movies. It's as visually indistinct and paint-by-numbers-plot-driven as most Marvel Comics-based projects, especially the gaggle of recent Avengers-related films. That creative deficit is a major problem in "Days of Future Past" since it follows characters who travel in time to prevent a future apocalypse. Thankfully, there's just enough right in "Days of Future Past" to offset what's wrong. Director Bryan Singer's confident direction mostly compensates for familiar comic book movie problems, including bald expository dialogue and forgettable action. The storytelling has such momentum that you don't have time to realize that the story lacks urgency. The movie starts in the future. A murder of mutants led by benevolent Charles "Professor X" Xavier (Patrick Stewart) and frenemy Erik "Magneto" Lehnsherr (Ian McKellen) conspire to save both human and mutantkind from shape-shifting, killer robot Sentinels. To prevent the Sentinels from becoming government-sanctioned weapons, the mutants send Logan/Wolverine (Hugh Jackman) back to 1973 to stop Raven "Mystique" Darkholme (Jennifer Lawrence) from murdering the Sentinels' creator, Bolivar Trask ("Games of Thrones"'s Peter Dinklage). And in the process, Logan is forced to motivate and re-unite younger versions of Raven, Xavier (James McAvoy), and Magneto (Michael Fassbender). Unfortunately, the obstacles that stand in Logan's way and the stakes that he's fighting for aren't particularly well-developed. "Days of Future Past" moves so fast that you might think Dennis Hopper posthumously strapped a bomb to it, and yet the relentless forward motion proves a mixed blessing. "Days of Future Past" is the seventh X-Men movie since 2000. As a result, Singer (director of the franchise's three best films) and screenwriter Simon Kinberg are confident enough to bluster through key scenes with just enough one-liners and character-defining action to push things along. But it's still frustrating to see such a propulsive film selectively revisit certain subplots. There are precious few scenes set in the film's dystopian future, and such new supporting characters as Peter "Quicksilver" Maximoff ("American Horror Story"'s Evan Peters) and Bishop ("Intouchables" star Omar Sy) are given as little screen time as the future versions of Xavier and Magneto. More importantly, key character flaws, such as young Xavier's need to take a drug that removes his powers but gives him the ability to walk, are barely developed. In place of real development we have blocky dialogue, as when Logan and young Xavier first meet, brusquely explaining away almost all of Xavier's insecurities in a scene or two. It's nice to know that these shortcuts were made for good reasons; Singer and Kinberg were at least thoughtful enough to consider their sprawling story when they pared down their plot to its necessities. But hearing characters diagnose and cure each other through the power of motivational speechifying gets boring fast. Xavier is the worst character-shaped plot device in this regard. Because he's a telepath who has an established partnership with both Erik and Raven, Xavier already knows what ails Raven, Erik, and even himself. He eventually pumps everyone up slowly, empathetically, boringly. He even gives himself a boost thanks to the power of time travel, communicating from the future to his past self (this scene sadly contains Patrick Stewart's biggest chunk of dialogue). Xavier's speeches stink because they serve to remind you how much meat is missing from the rest of the film. Still, on a moment-by-moment basis, "Days of Future Past" is a fun popcorn movie. While the film's uncanny cast doesn't get enough time to show off, they are at least charming enough to make you want more. Singer's assured grip on his characters is what makes his X-Men movies the best of the bunch. He's exceptionally good at pacing and realizing set pieces like Magneto's prison break or the first fight between the Sentinels and the future X-Men. The film also takes time out to wink at viewers, as when Wolverine, now without a metal skeleton, lets out a confused sigh of relief as he quietly passes through a metal detector. That kind of confident, knowing approach to established characters goes a long way in a story that often feels like a merciless treadmill.